Did it turn down the Nexus 7 for a larger slate? HTC-made Nexus 10 to join the Nexus 8? The Nexus 10 2014 edition could be built by HTC, even though it hasn't teamed up with Google on a new device or manufactured a tablet in a number of years. The Taiwanese HTC One smartphone maker is being tapped to make a next-generation Nexus 10, reported salt-required DigiTimes, citing anonymous industry sources. It backs up previous rumors that HTC won the rights to make the Google-branded 10-inch tablet in time for a third quarter release this year. If true, the Nexus 10 2 would mean that HTC is taking over the current Nexus 10 production duties from Samsung, which began making the tablet in late 2012. Samsung, for its part, has moved on to manufacturing its own Galaxy Tab 10.1 2014 anyway, as well as even larger tabs like the Galaxy Pro Note 12.2 and Galaxy Pro Tab 12.2. HTC and Google haven't made a Nexus device since debuting the first-ever Nexus phone, the Nexus One, back in 2010. 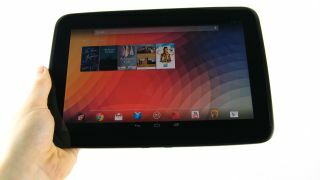 Google wanted to give it another go with a 7-inch Nexus tablet in 2012, but HTC turned down the offer, according to DigiTimes, leaving the door open for Asus to make the Nexus 7. HTC may have been wary of these mini tablets since sales of its 7-inch HTC Flyer and 10-inch HTC Jetstream, both released in 2011, failed to gain much traction. Meanwhile, the Asus-manufactured Nexus 7 turned out to be a success as did its follow-up, the Nexus 7 2013. The company is now speculated to be moving on to the Nexus 8. HTC may have a second shot at making a high-end Android tablet in addition to the HTC M8, off-setting the less exciting news that it's looking to focus on cheaper handsets too. HTC M8's second sensor won't be a fingerprint scanner after all.